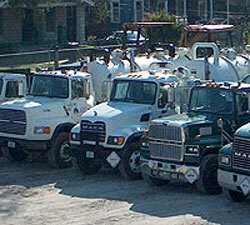 ERS has a fleet of vehicles to fit you every need. We own and operate three vacuum trucks and a vacuum tanker which are used to transport Hazardous and Non Hazardous Liquid Material. Our vacuum trucks have a stainless steel tank which allows for the transport of acidic or caustic material. 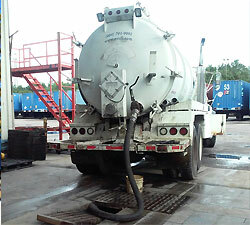 Our vacuum trucks can carry a capacity of 3000 gallons and the tanker can carry up to 5400 gallons. The stainless steel truck is equipped with a 3000 psi pressure washer that can connect to a butter-worth system that is used to clean AST’s and UST’S without the need of confined space entry. We also have a large box truck with lift-gate that can carry up to 39,000lbs. If you are in need of a roll-off container, we also provide those services as well. 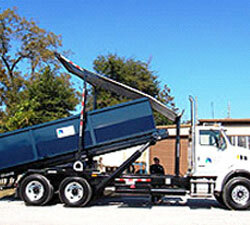 Our roll-off truck that can haul 20 cubic yard boxes containing bulk solid waste. We can schedule to drop-off or pick-up your boxes and haul them to an approved waste disposal facility.